We’ve had a fast and furious start to our new life in Spain and I can hardly believe it’s been just over a week since we arrived in Alicante. 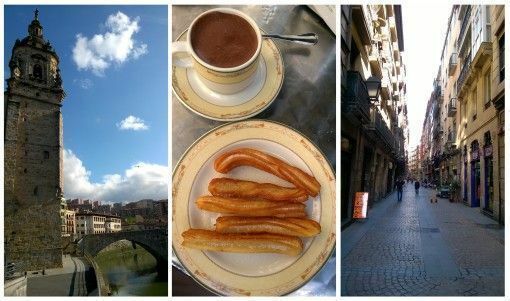 Our brief introduction to Spanish life so far has been filled with highs as we’ve explored beautiful medieval towns, sampled some tasty tapas and stayed with some lovely local hosts. However, there have also been a few lows (and one anxiety attack in the supermarket) as we’ve grappled to get to grips with cultural differences and look ahead to plan our new life in Madrid. Our journey to Alicante was one of the easiest we’ve ever experienced. 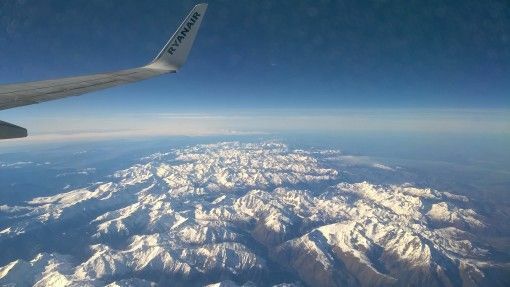 My parents dropped us off at nearby Bournemouth airport and the short two-hour flight whizzed by as we tucked into our Spain guidebook and paused to take in immense views of the Pyrenees beneath us. There was none of the lingering angst I sometimes experience when leaving the UK since I know we’ll be just several hours away; this was one of the key reasons we wanted to move to Spain and we’ve already booked super-cheap flights back for a family visit at Easter. 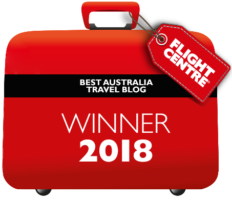 We disembarked to sunshine and cool blue skies, a welcome relief from the dull, grey drizzle of an English January, and after a nonchalant glance at our passports, we breezed straight through security and out of the airport – so simple! Not even the hefty fuel charge we were unexpectedly made to pay when we picked up our hire car, which cost more than the £55 we actually paid to rent the vehicle, could dampen our mood. That evening we strolled down along the promenade and into the old town for dinner, marvelling at the clock towers, narrow cobblestone lanes and the bars spilling out into the medieval streets. 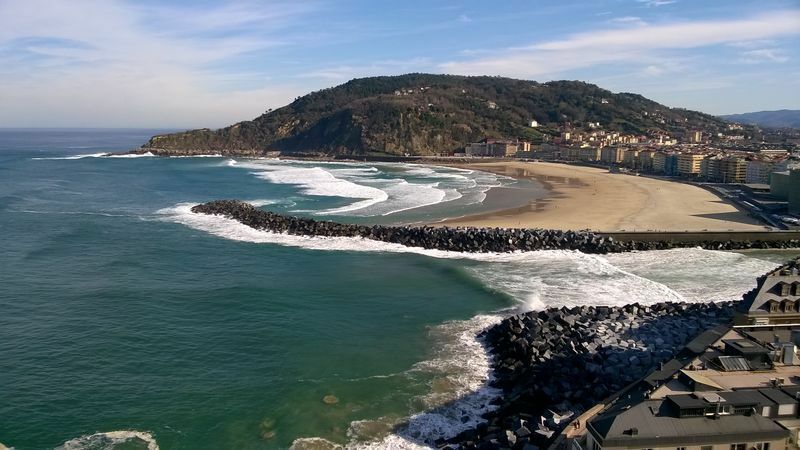 Wanting to make the most of our four-week car hire, the next morning we made the nine-hour journey up to the Basque Country in the North of Spain; watching the landscape change from barren, orange scrubland studded with rocky mountains to green fields, forested hills and farmland. The last of the southern warmth also disappeared as we drove, replaced by a fine curtain of mist draped over the countryside, darker skies and a frosty nip to the air. 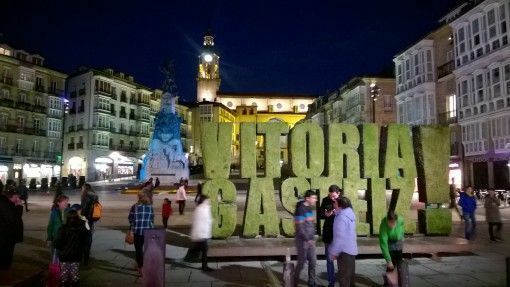 Our first stop was in Vitoria, a city which lies in the province of Araba in the middle of the Basque Country. As usual, we’ve found Airbnb to be the cheapest source of accommodation in Spain and we used it to rent a room with an older couple called Amalia and Elias. 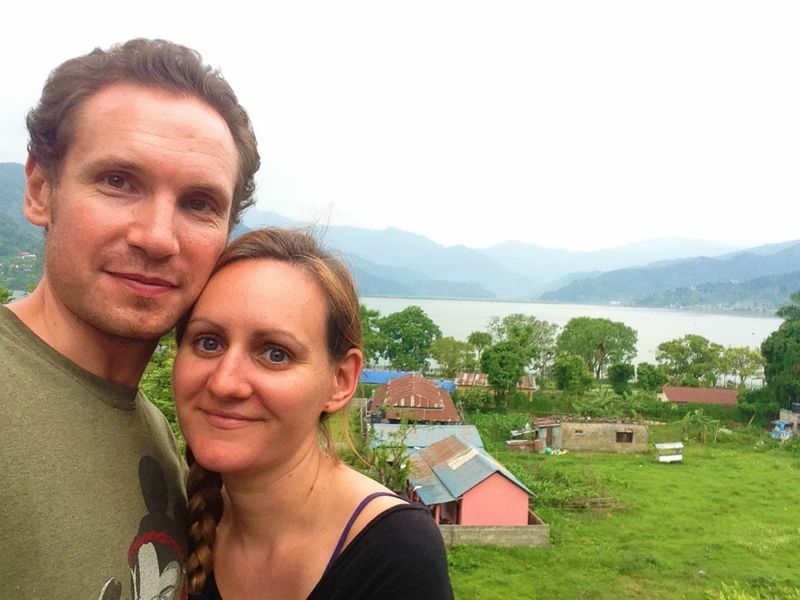 They looked after us so well, offering home-grown fruit and veg, pouring us wine and chatting to us over meals – Amalia even made me hot water bottles when I came home after cold days of sightseeing. 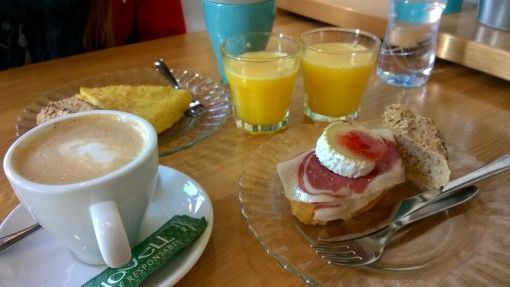 We felt like we were in a homestay experiencing a slice of Spanish life, which, when it works well, is the beauty of Airbnb. Given that Elias and Amalia spoke no English, Andrew also had plenty of chance to practise his Spanish and translate for me; since I am just starting to learn the language, it was good for me to listen in and try to pick out words. If you’ve never used Airbnb before, you can get £20 free credit to spend on the site if you sign up using this link. 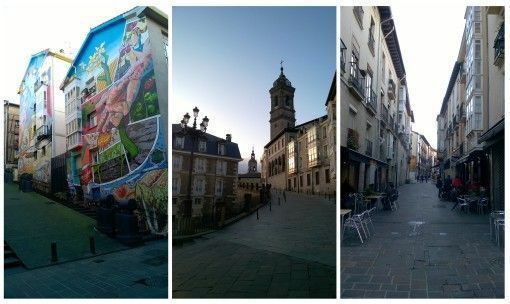 At the heart of Vitoria there’s a medieval old-town full of steep lanes lined with restaurants, bars, shops and wooden-shuttered, terraced buildings. 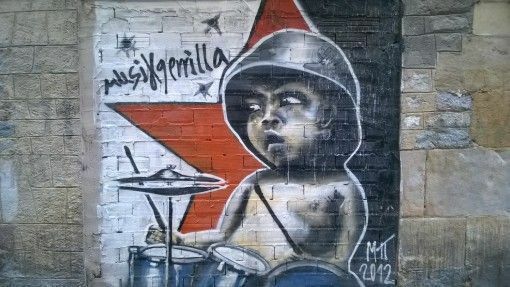 The ancient streets are interspersed with open plaza squares and ornate cathedrals; occasional street art and murals add a contemporary twist. From the old-town the city sprawls out into modern streets, shops and parks. One evening we were kindly invited for dinner by one of our readers, Nathalia, who currently lives in a beautiful apartment with her husband and son right in the centre of Vitoria. We were really inspired and reassured by their positive stories about life in Spain and we were grateful to get some advice on finding apartments, getting sorted with NIE (foreign identity numbers) and moving to Madrid; since Nathalia is also an English teacher, she was able to give us tips for finding work too. From Vitoria we took daytrips to explore the Basque region, starting with San Sebastian, a rich summer resort on the coast which is famous for its pinchos (tapas). 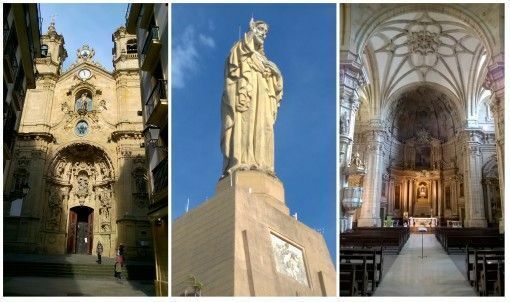 We spent the day wandering around the old town, stopping for drinks and snacks, visiting the cathedral and climbing to a castle on a hill topped with a huge statue of Jesus. From the top we got great views of San Sebastian’s famous stretches of wide sandy beach, the red-clay roofs of the city beneath us and the sea stretching out into the horizon. We were also impressed with Bilbao, a modern city with a typical Spanish medieval centre. After falling into post-industrial ruin, Bilbao has recently been reinvented as an artistic commercial hub. 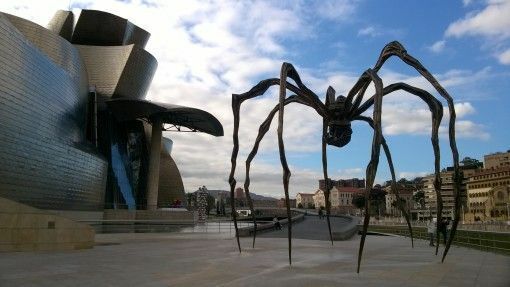 The city is particularly famous for the Guggenheim museum, which is an impressive architectural, alien-like building with a giant metal spider sculpture outside. 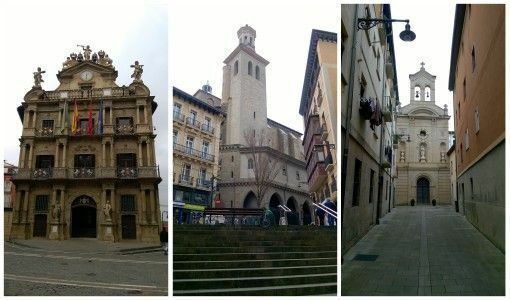 We also visited Pamplona, home of the notorious San Fermin (Running of the Bulls) festival, but we liked this city less; it felt quieter and less charming. 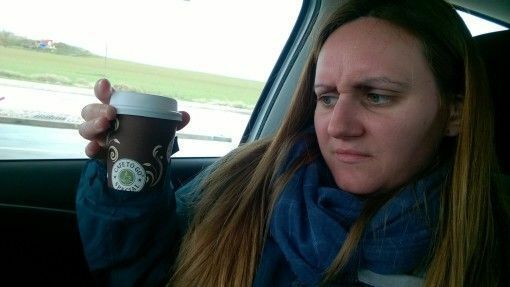 Despite all the sightseeing, we’ve also been attempting to slow down and adapt to ‘Spanish time’, which differs a lot from what we’re used to. Normally, Andrew and I head to bed pretty early in the evening and are up all day without an afternoon rest, as is normal in the UK. In Spain however, people often eat dinner as late as nine or ten in the evening, stay up until the early hours of the morning (walking home from dinner with Nathalia this week, we saw a lot of people casually walking their dogs at almost two in the morning!) and catch a siesta in the afternoon. Even if people don’t nap during the afternoon anymore, many shops, businesses and restaurants are closed for a few hours. Perhaps we’ll eventually adapt to this Spanish-style day when we start working in Madrid. When we lived in Hanoi, we managed to adopt the Vietnamese routine of rising early for morning classes, eating lunch at 11.30am and napping before returning to school for afternoon and evening classes. For the moment though, we’re in a weird transitional period of travel where our days are unstructured, yet we know that in a few weeks’ time we’ll have to deal with setting up a proper life and getting into a working routine in Madrid. One thing that we have managed so far is to eat pretty well in Spain. 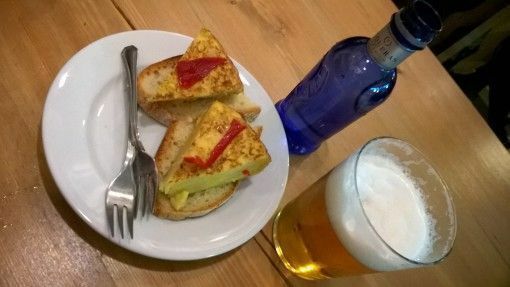 Unlike in Asia, finding food I enjoy in Europe is not an issue; Spain may not be as veggie-friendly as it could be, but there’s definitely plenty for me to eat. Firstly, let me tell you about Carrefour – I love this supermarket and remember it well from holidays to France when I was younger. Andrew and I have been stocking up on cheap fruit and veg from Carrefour as well as delicious baked goods – the bread, croissant and cheese selections are amazing! 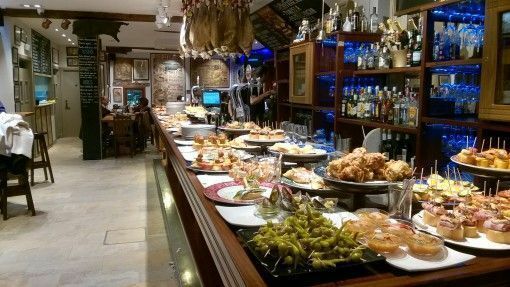 We’ve also been enjoying Spanish food as the Basque region is well-known for its pinchos and tapas. 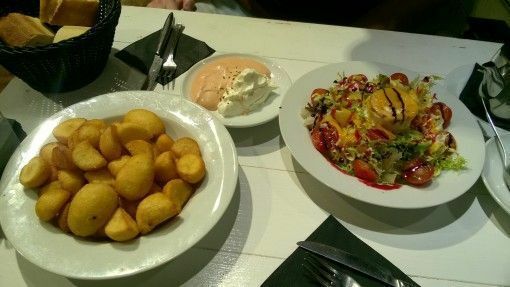 True, much of that is meaty, but there’s always a salad option (often including goats’ cheese), tortilla and patatas bravas and we can also usually find a vegetable pasta/rice option. All this is pretty cheap too, pinchos usually cost between one and three Euros each and you can buy bigger portions called Raciones, for a few Euros more. We’re now in Leon and here you get free tapas with every drink you buy – last night we spent €3.20 (£2.45) on two drinks which included two free tortillas. This week hasn’t all been plain sailing though. As expected, I’ve had some mini-meltdowns and I’m sure there’ll be many more of these to come, especially when we finally get to Madrid and begin apartment and job searching. If I think about this too much I start to get incredibly anxious, worrying that we won’t find a nice apartment, that work will be scarce as it’s the wrong time of the year and we’ll end up burning through all of our savings. Add that to the pressure of having to learn a new language while Andrew can already speak and understand Spanish, and it can all get overwhelming. 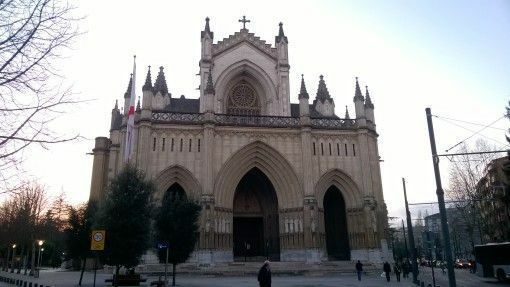 One afternoon, for example, after unsuccessfully searching for a reasonably-priced place to stay for when we first arrive in Madrid, all these worries caught up with me and I had a mild anxiety attack in the supermarket which reduced me to tears in the fruit isle. It was pretty ridiculous. Still, I remember how we stumbled when we first moved to Hanoi too and everything eventually worked out fine, so I have faith that the same will happen in Spain. Soon, the unfamiliar will seem normal and those little irritations will fade; like the fact that tea is served in espresso-shot style portions (I drink it by the pot-load in the UK) and beds here seem to have just one long pillow which you’re expected to share (!) with the person next to you. So there it is, our first week of Spain in a not-so-concise nutshell. We’re spending this next week in beautiful Leon before moving on to some serious sightseeing in Barcelona. Thanks to all of you for following our Spanish adventures so far. That whole pillow thing wouldn’t work out for me and Mick hehe! I’m sure you’ll find your way in Spain too! Thanks for letting me share in your big adventure. I’m living a quiet life in Sydney but I do want to live in both Spain and the UK at least temporarily at some stage so it’s good to hear about what you’re doing. Isn’t it funny how you stress about things and as soon as they fall into place (as they always do), you completely forget that stress. Best of luck settling in. Hi Mel, thanks so much for reading and commenting. You’re right, all that stress doesn’t seem important once everything has worked out, I’m sure that will be the case in Madrid. We thought Sydney was a great city; hopefully we can inspire you further to cross the pond with our tales of Spanish life! Amy, I am glad you managed to fly from Bournemouth it makes the journey so much easier leaving from a small airport, I always love when I can do that. I am sure all the anxieties will melt away as soon as you and Andrew manage to settle down in Madrid. It is great that Andrew can already speak Spanish and it will not be long before you will learn to speak it also. A proper nice cup of tea is essential for me also, I drink gallons of it every day. Good luck with the job and apartment hunting in Madrid, I will be keeping fingers crossed for you? I’m very much looking forward to reading all about your experience living in Spain as we’ll be doing a Spain & Portugal trip exactly the time when you’re back in the UK lol! I almost had a heart attack trying to find a decent hotel in Madrid that didn’t break the bank. I eventually did but it wasn’t easy. We’ll be staying at a THC hostal near La Latina. Is that a good area? I’ve been to Madrid before and even though I prefer Barcelona, I’m hoping that my visit this time around will make me change my mind, being that it’s 13 years later lol! Ha! Ha! I forgot to warn you about the pillows! Aren’t they ridiculous?! When we were walking we asked for twin beds as often as possible so we could have our own pillow. And oh yes, the Spanish are meats eaters – hearty ones at that. But as you say there are options and finding a place that serves a good tortilla is always a plus. When we got home from Spain I figured out how to make a tortilla (post on my blog) and I make us one from time to time, always brings back memories. I think you’ll do great with Spanish, it’s actually a fairly easy language to pick up (not that I speak it) because so many of the base words are similar to English. You’ll do great! Have fun and try not to stress about the unknown because you know what? You can always go with Plan B, right? !